I crawled under my neighbour's feijoa bushes today to gather those which have fallen onto the damp ground while they are away on holiday. This was a very small price to pay for the pleasure of having a bag full of feijoas to take home. To my mind the best way of eating ripe feijoas is to simply cut them in half and scoop out the flesh. But they also make great smoothies. Recently I've been combining them with Gingerella ( made by All Good who also import and market Fair Trade bananas). 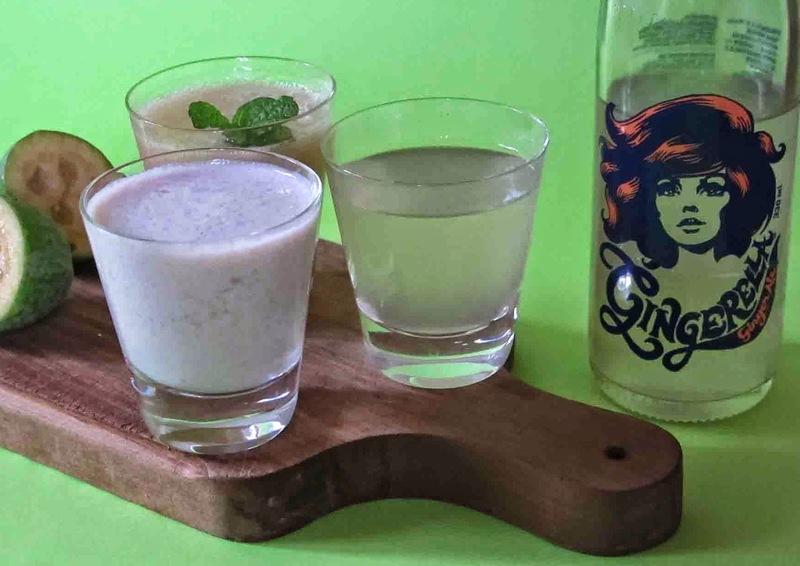 Gingerella's Fair Trade ingredients are sourced from far and wide and include organic ginger from Sri Lanka, vanilla from Papua New Guinea and sugar from Paraquay. It makes a very refreshing drink on its own but feijoas do add more goodness. The second recipe contains a lot more protein and makes a good start to the day . The tofu does have to be fresh and soft so it will blend easily.